As the e-commerce market continues its rapid expansion, customers are becoming accustomed to receiving their orders promptly – often by next day delivery. Competition is fierce among online retailers and companies are judged by the speed and accuracy of their response. In a busy distribution centre (DC), manual processes are too time consuming to be cost effective and one proven way to increase productivity is the use of conveyors with other materials handling equipment to automate the movement of goods. An automated packing and despatch solution for Asda Stores Ltd designed and completed by Axiom GB, has enabled the company to double the order throughput of its online George.com homeware merchandise. The new system, which is located at Clipper Logistics’ Boughton facility in Nottinghamshire, combines conveyors with automated box making equipment, scanners, checkweigh, automated lidding, labelling and sortation machines. To ensure absolute accuracy of orders many internet retailers incorporate strategically placed scanning equipment into their conveyor solution. Providing each box is barcoded and assigned a unique order number at the start of the process, the scanners track the orders using software which links into the warehouse management system. This method of double-checking that orders are accurate is guaranteed to eliminate picking errors whilst simultaneously improving the efficiency of the business. One of the UK’s leading kitchenware companies, Lakeland, has a mail order operation which processes more than 1.3m orders each year. Axiom was selected to automate their entire packing system with conveyors, packaging machines and labelling equipment. Now 75% of their orders go through this automated route. These orders are processed at the rate of 44 per person per hour, an 80% increase in productivity compared to the orders that are still packed manually. 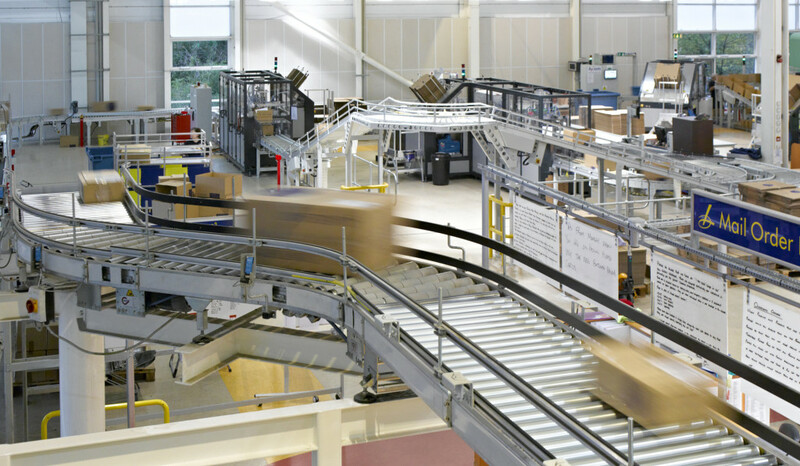 Whether it’s presenting empty boxes to pickers or transporting completed orders through packaging processes to the loading bay, today’s modern conveyor systems are increasingly relied on by online retailers to boost the output of their distribution centres.